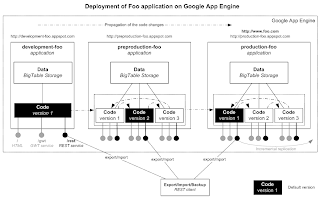 I use Google App Engine for Java since it was relased. I did a few smaller projects like Facebook application for behej.com backed by AppEngine in the past. Recently I started to use AppEngine more seriously. Therefore I had to define environments and procedures that are closer to these that are commonly used in the enterprise environment. This is where I do actual development of the application apart to localhost. There are no restrictions on changing the code and data. Data might be screwed (even intentionally) and/or deleted. The purpose of this environment is to enjoy the freedom of development and testing AppEngine features and APIs online. I use pre-production instance to verify that new version of the application (that I plan to release) works with the production data and that the upgrade will be smooth and easy. The data are replicated from production to pre-production only from time to time. Therefore there is always a slight difference which is perfectly OK, because this instances is not supposed to be backup. For the replication of the data I use REST interface of my application. Alternatively you may consider for example incremental pull-style (replica is pulling data from the master) replication of the data using TX backed Tasks (copy only if TX succeeds). This is where the production version of the application runs and where real users are working with the real data. 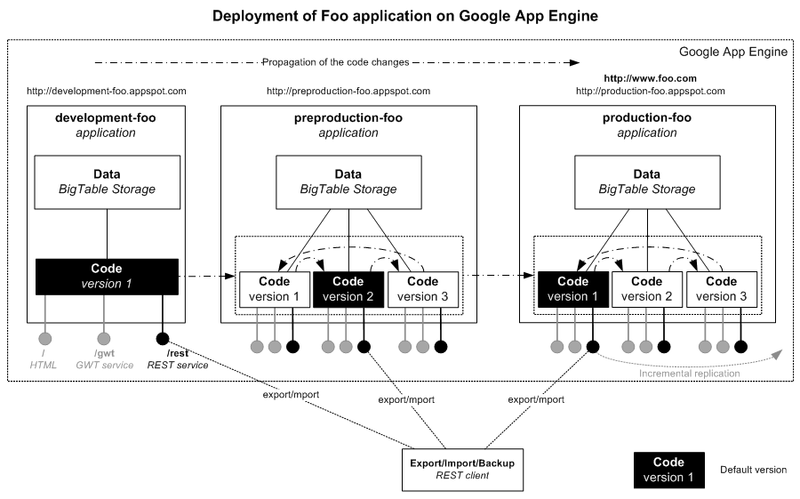 AppEngine supports multiple versions of the applications to be deployed. Note that these applications share the same storage. Let me presume that the production application is deployed as version 1 and this version is made default. Upload new version of the application - version 2. Make the version 2 the default. This is zero downtime upgrade. You don't have to define new version each time you deploy a new application version - I rotate just 3 versions as shown in the diagram above. Disable the access to the application and display maintenance info page to users. AppEngine storage can be also switched to read-only mode from the administration console. With Datastore Admin tool You can safely copy data between different applications. This tool can be used to migrate from Master/Slave to HRD datastore, but also for a backup. Bulk loader tool (yes, it works with Java). Alternatively with your own backup service (for example REST-based) and tool - as I do. Although AppEngine doesn't support snapshots (yet ;-) you can easily implement them yourself. For example by creating set of "snapshot" variants of your persistence beans. By adding 'snapshot' field to these beans you can even maintain multiple snapshots. Again you can use namespaces in this case. This is in place (scope of single application) backup and/or transformation. The backup can include only entities (and entity instances) impacted by data model changes. Typically there is no need to dump whole storage. Offline on the exported image which requires subsequent drop of the all affected datastore tables and import of the new image. In-place transformation that is realized by running a set of statements (export/drop/import not required). The same steps as above - new version upload, test and release. Switch off the maintenance info page and enable the access to application again. The procedure described above is pretty expensive as the amount of the data grows. You have to basically pay for re-imaging the application (requests, bandwidth, read and write operations). Such approach obviously becomes unusable once your storage size is bigger than small. Zero downtime could be achieved for example using 2 isolated applications, data replication and DNS reconfiguration. I'm not that far yet. If there is really need for such a change, rather create a field with new name, deprecate the old one and define an administrative task that will copy the data from the old field to new field and/or default value. Use deprecation in the same way as above. This guideline might be translated to - allow null values on the persistence tier, because it can make your upgrades doable on top of AppEngine repository. For example consider that you want to introduce a new field and compare boolean vs. Boolean. The datastore upgrade will fail in the first case. Major application release is opportunity to remove all deprecated fields, polish your data model and do the transformation of the data. My application is opened to users for several months and I'm still in learning new tricks and improving the procedures described above. The obvious motivation is to make sure that the application will run without any problems and outages .